The Jefferson Forest is just down the road from me. Years ago, it was primarily horse trails. But the city has been taking over this area, and there are only a few horse farms left. I think that we are about the only riders left using the Jefferson anymore. Mostly it’s dog walkers and mountain bikers now. The forest is quite lovely, with steep hills, big trees, and lots of small ponds. I took some video, but as usual, it gives no real sense of how steep the grades are. So… it’s kind of amazing really. But Venice has gone through something of a sea change in the last couple of weeks. She is now learning very quickly. There is still a ton of work to do of course. She is very head shy, so I have to be very slow and deliberate when I’m clipping a lead shank to her halter. And I cannot touch her face yet. It’s okay if she makes the choice to touch me (and she does that often). But it must be her choice. The pressure is too great if I reach towards her. 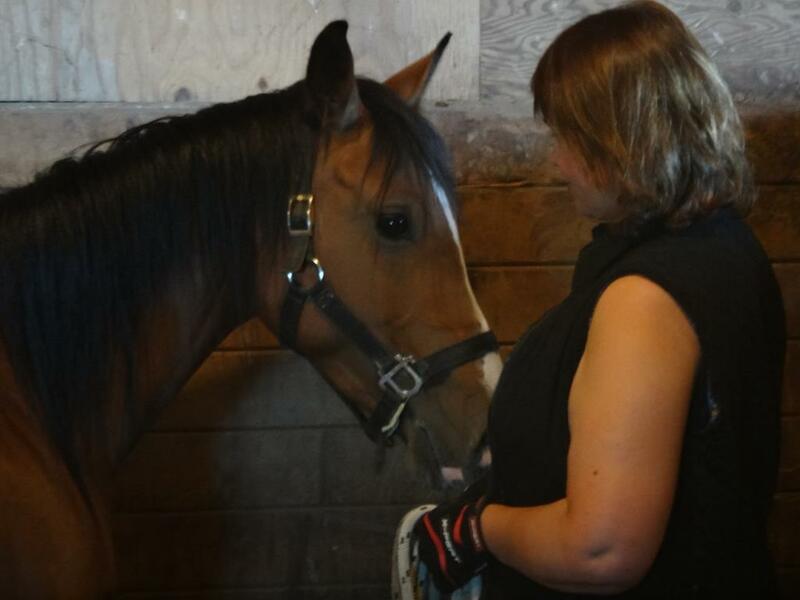 But I can touch her cheek now, and can take hold of the halter by the throatlatch. So there is progress on that front too. She is leading much more reliably now, and has not startled away or tried to bolt for a week or two. I can draw her towards me and back her away (either with a touch to the chest, or just by walking into her space). In the last couple of days, she has learned several voice cues… “walk”, “trot”, and “whoa”. Trot and whoa seem to be solid already. 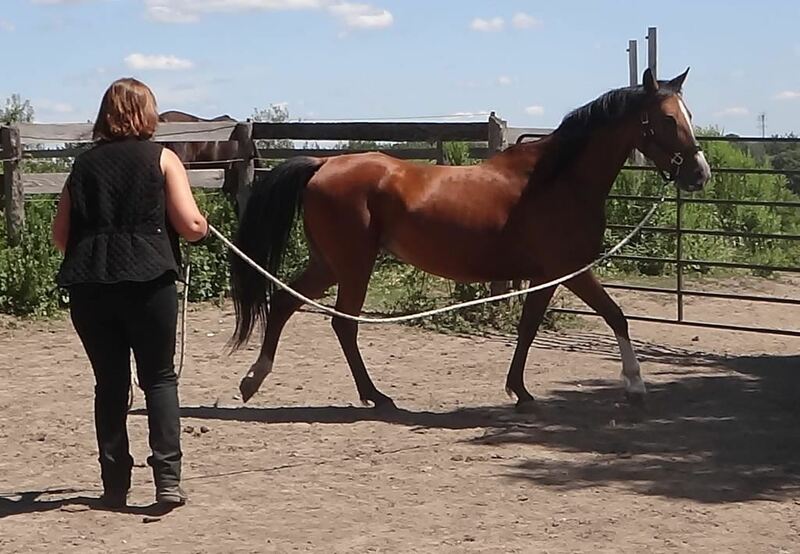 The walk cue is a bit harder, but it’s obvious she understands it, she just has a bit more energy than is optimal for a walk and sometimes breaks up to a trot, especially when she’s a bit tense. Her circles to the left are excellent. Round, relaxed and forward. She keeps her focus tightly on me, no matter what else is going on. Her inside ear is locked on all the time. She is soft, light, and nicely bent. Her circles to the right are more difficult for her. But they have improved tremendously, and are now mostly round. She’s not totally relaxed, and so is not going freely forward yet (though markedly better each day). But she is moving on as long as I encourage her periodically. And even though she’s unsure going to the right, she’s still very focused on me, and responds to to the voice cues. She is really a little darling! So the DNA tests have come back, and Venice has had her registration papers reinstated. She is who she is supposed to be. Sire and dam are both correct. The breeder had sent in hair samples from her full sister instead of Venice. So once I sent in a new sample, it sorted everything out. It also sorted out Venice’s daughter’s registration, since she’d had her registration denied (that’s how this all started… when Savannah’s owner tried to register her). The registry is mailing the papers out. I haven’t done much with her lately. Last week was too hot, and I was not so energetic after Flesherton. But today I had a short little session with her to get her training back on track. She is a very soft little mare, now that we are past being panic-stricken all the time. Extremely responsive even (which is the silver lining of over-the-top reactive). She is more and more willing to take a carrot from my hand, so I hope to start clicker training with her soon. But so far, the risk of taking food from a human hand is more risk than reward for her. Here’s a few seconds of video from today. Her dapples are not really visible, but I think the gorgeous metallic gleam of her coat sort of comes through. She’s not very big, but she’s got the trot of a much bigger horse. So with the trot, the brilliant light bay colour, and all the chrome, she’s pretty flashy isn’t she? Just don’t look at her feet too closely since they are dreadfully in need of a trim. They are starting to chip off now that she’s getting more turnout though. I’ve been looking for a saddle for Diego for a while now. I already knew we had a fit problem before the Flesherton ride. But after we finished (and passed the vet check with no issues), he came up very sore over his loin area. Initially I thought it was regular soreness from pressure. But realized the next day that it was actually a friction burn. The skin was dried out and wrinkled. The back of that saddle tends to waggle a bit (which is a fit problem). And in high heat/humidity that movement during a long ride was apparently enough to burn him. At any rate, I promised Diego after Flesherton that he would not have to compete in that saddle again. So the saddle search has jumped way up the priority list. I tried a nice old Schleese saddle with an adjustable tree first. But it just didn’t seem to adjust the right way for him despite a great deal of tinkering. I had to take it back. Now I have a Reactor Panel saddle here to test. It’s a dressage model, so not the model I’d be taking in the end. But it’s allowing me to try out the fitting process and see how it will work. There’s a bit of a learning curve with Reactor Panel saddles, but they are pretty much infinitely adjustable, so long as I can get the right basic tree size. I managed to get the panel adjustment roughly correct. But I have a feeling I need to put the thin discs in front, instead of the mediums that came with it. Lynda suggested that it was more normal to have thin discs in front and mediums behind, so it would be a reasonable guess. Diego has been a very good boy through all this saddle tinkering. I’ve been messing with his back every night this week. Putting saddles on, taking them off, taking pictures, measuring. He just stands patiently on the crossties, periodically chewing on a handful of hay when I think he’s been good long enough. 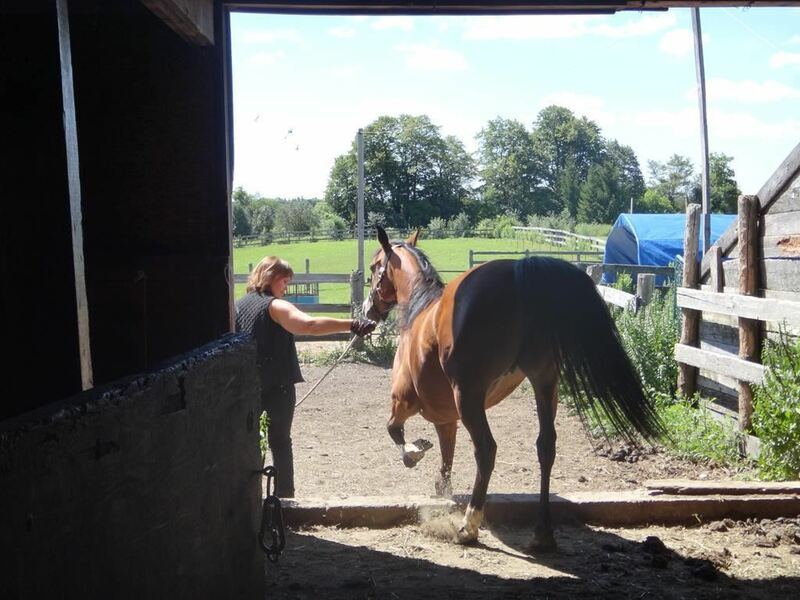 Yesterday, I tacked him up and went out to test ride the saddle. It felt sort of okay initially. It puts my legs in a good position and feels quite secure. But at 17.5 inches, it’s just a shade too tight for me. I prefer an 18 inch. Not only is my behind somewhat cushier than it used to be, I actually have fairly long thighs. So my knees end up a little close to the front edge of the knee flap. I realized after riding in it for a while and looking down at the panels that I had gotten them just a little bit out of alignment. Eventually I noticed that the saddle was shifting to the left. Part of that could be me, since I suspect I ride a little bit crooked now that I’m mostly riding with one hand. But Lynda tells me that if a panel is too high it will cause that. So likely that’s the problem. After a few miles, Diego started turning around and trying to chew on the billet straps on his right side. Definitely something bothering him there. I suspect that it might be because I used the rear billet strap instead of the third one. You are supposed to use the two billets in the middle normally. The front and rear billets are for correcting fit problems. After about eight miles in the saddle, I started to get really uncomfortable. The twist was too wide for me. Not sure if I can describe this, but the seat feels like a table. Flat across and then suddenly dropping away under my seatbones. Lynda says she normally gets saddles with a narrow twist and this one has a normal (wide) twist. So I won’t need to worry about that since whatever saddle she finds for me will have a narrow twist. I’ve ridden RP saddles before and really liked the seat. But obviously they were RPs with a narrow twist. 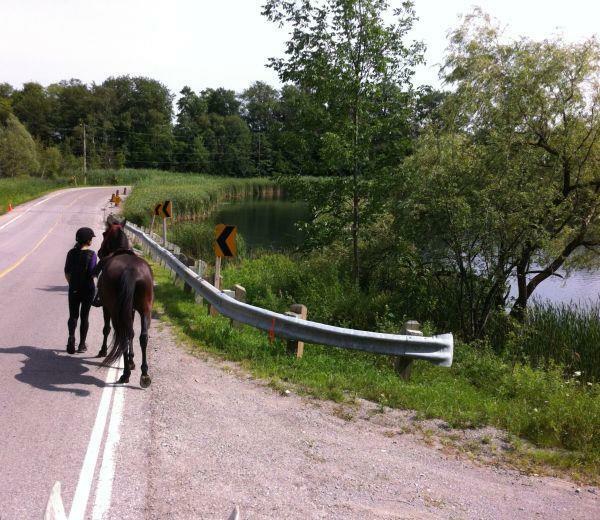 Ana (on Ares) and Veronica (on Ella) came along on today’s ride. It was a gorgeous summer day. 24C, so absolutely perfect weather. I took them down to the Jefferson Forest. It’s about two miles down the road. It’s a paved road with narrow shoulders, which is why I don’t often go down there. Sundays there is usually a little less traffic. But every year there’s more which is a bit unnerving. Diego is very good in traffic though. He is not fussed by motorcycles, or bicycles, or schoolbuses, or Porsches with inadequate mufflers. Ares was reasonably good, but does have an unreasoning fear of guardrails. Ella had an “Ella spook” at a culvert (she looked sideways at it). But overall the road part went well. The drivers were all respectful and took their time passing us. Once down at the Jefferson Forest though, it was like entering a deep, dark, primordial forest. The trees are huge, and the trails are narrow and winding along the top of ridges, and up and down ravines. It really is a gloriously beautiful little treasure of a spot. I tried to take pictures, but none turned out (low light, so the little camera ends up blurring shots from a moving horse). 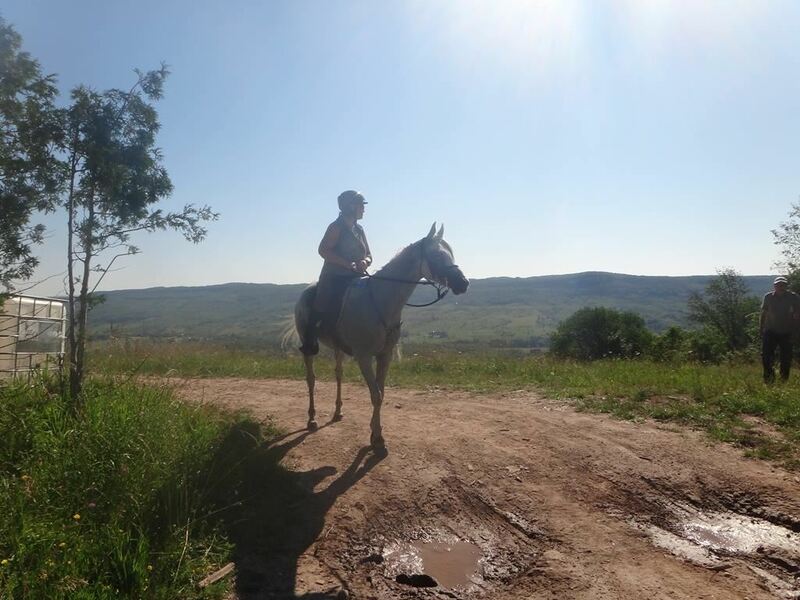 Ana was quite boggled by it and was already planning more rides… both on horseback and by bike. There are probably 20 miles of trail or so if you do them all and also go over to Bond Lake as well. However, neither Ella nor Ares was ready for that distance. So we just did a short loop through the trails and then rode over to the farm where I work. On the way over, Diego nearly stepped on a pheasant in the tall grass. He leapt sideways, the bird ran around in a circle then bolted, and I managed to hang on to my seat, albeit with little grace. It was a righteous spook, so he got no blame for that one. In the front paddocks, the boys all went kind of crazy at the sight of strange horses just swanning blithely into their territory. Reno and Al had a little head-on collision. Parker’s eyes got huge and he floated around, whistle-snorting in excitement. Jasper, being a fragile little guy (17.2hh) ran away. Max (aka the “flying yearling“) goes where Jasper goes, so he ran away too. Vegas bucked once and went back to eating. The boss was there and he came out to with some water bottles that were greatly appreciated. What a beautiful day for a ride. I spent all last week waffling about whether I should go to the Flesherton ride or not. Diego and I have been doing short easy rides all season. 12 or 14 mile set speed rides at very slow speeds. He’s been fine of course. He’s done a couple of fifties and has something like 300+ miles in OCTRA. So he fits up quickly. I’m the weak link in this partnership. I didn’t do much from late last summer until this spring when the surgeon cleared me to ride. The shortest distance available at Flesherton was 36 miles. And it was a silver level set speed ride. So the minimum speed to complete would be 5mph. Manageable on a normal trail. But Flesherton has some remarkably big hills. 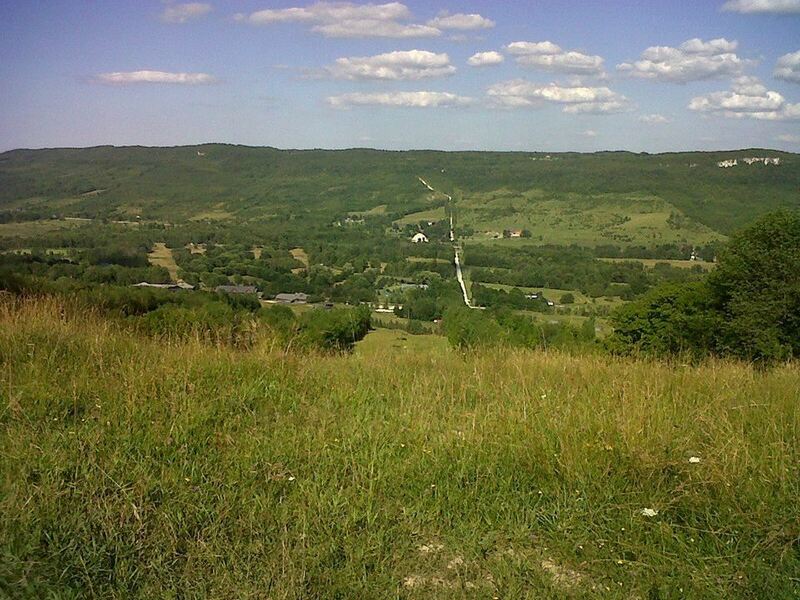 It’s ski country and the trail crisscrosses the Beaver Valley, going right up to the top of the hills on either side several times. Those hills are killers, and you have to do a lot of walking, which really cuts into your average speed. There’s also a lot of rocky footing, and some gravel roads. Diego has boots, but only for his front feet. So I was pretty worried about him getting footsore behind. All that is not even to mention that saddle fit has been lurking over us like a distant dark cloud. He has not been back sore for the most part, but a couple of times I’ve found a bit of a skin flicker in his loin area after longer rides. 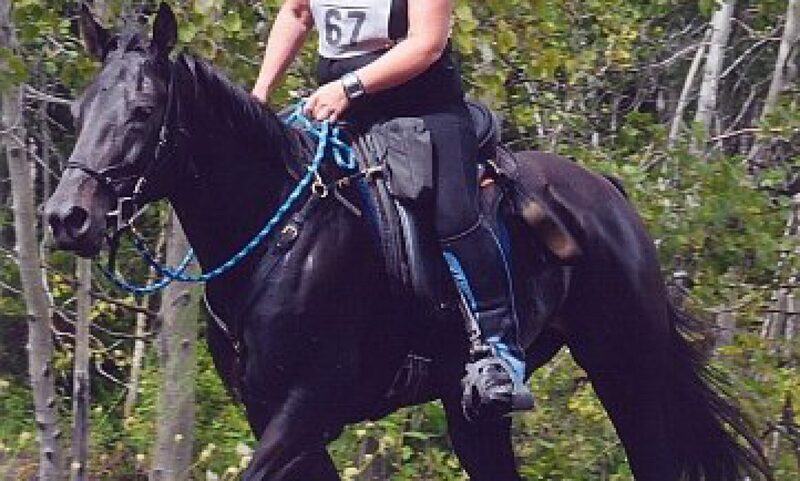 I’m using the same saddle that I had custom fitted for King, and then later rode Dressy in. Diego is a completely different shape though, and I have been padding like crazy to make it work. We came down that road on the far side, then back up this side to the top of the Talisman ski hill. And then later back down this side and back up to the top of the other side. Then off to the right (towards that rock bluff) and back down and back up this side again. But in the end, I decided to go. Knowing I could always quit at the mid vet check if we were falling apart. Saturday morning I loaded Diego up on the trailer and headed out. Veronica came along as my pit crew, and her husband Brian went to be the head timer. It had stopped raining, and the weather was sunny and warm on Saturday. But by Sunday it was really hot and humid. There was not even the slightest hint of a breeze. Diego’s kind of weather, but not mine. I’ve already proven, time and again, that I’m a heat stroke waiting to happen. There were not too many starters in the set speed (8). Most of the entries were in the 50. 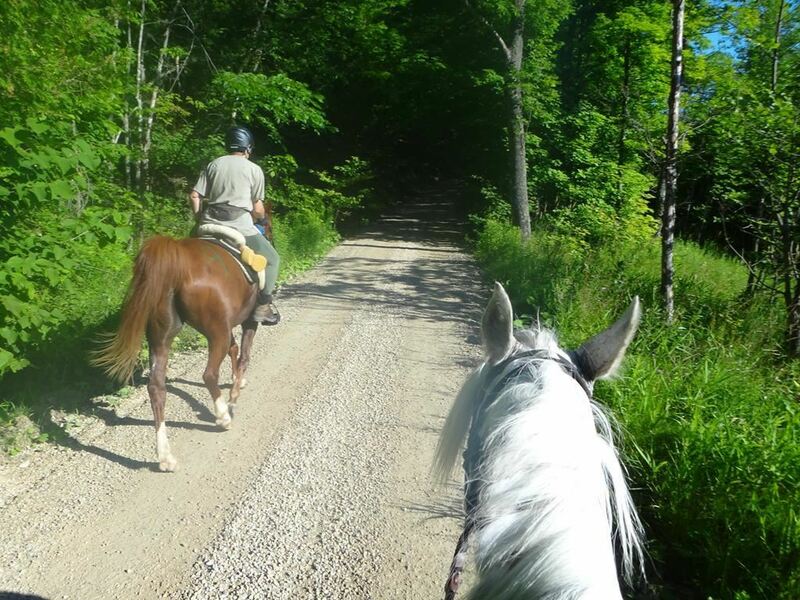 To enter the silver level, both horse and rider must have 250 miles of distance competition. So the field is limited. I asked Julie if I could start out with her for the first couple of miles. The Flesherton ride starts by going around several big hay fields, which can be a bit more exciting than optimal. 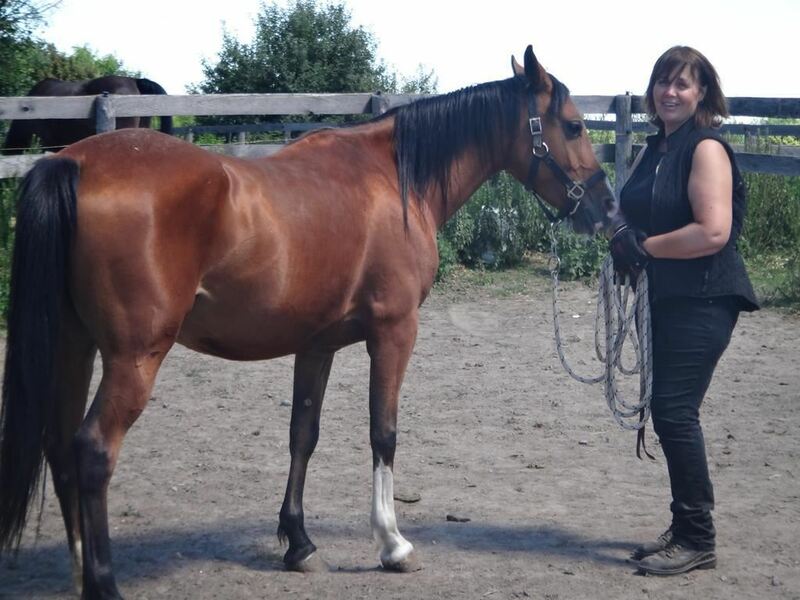 Julie is very very experienced (with nearly 10,000 miles to her credit), and her horse is quite steady. So we walked around ride camp until all the other horses had left, then went out walking. Diego was happy to have a buddy, and went out quietly and very politely. Diego has been a bit insecure and until lately has not liked to be in the lead. But we alternated the two horses on the lead and following, and Diego was willing and cheerful. 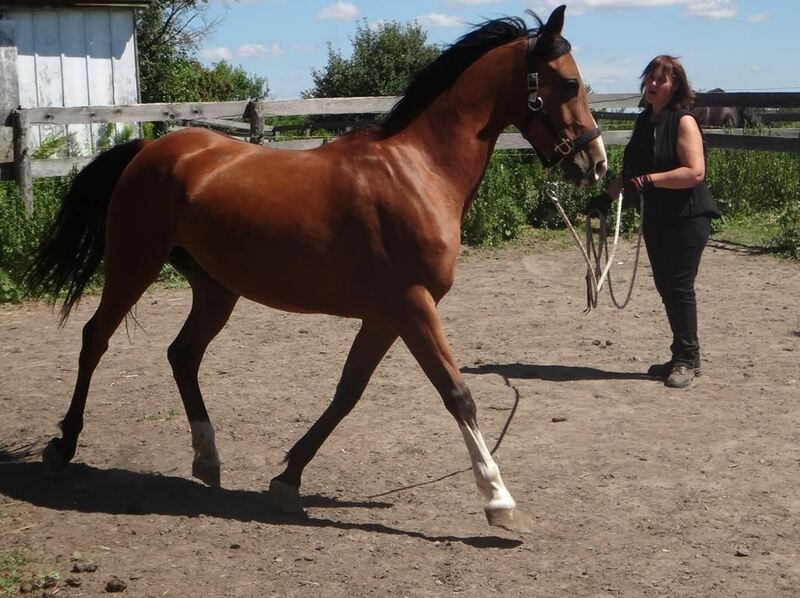 Roy (Julie’s horse) has quite a lot more confidence and has no issues with leading. They paced well together and both seemed happy. So I tagged along with her all day. The first loop was 22 miles. After the hayfields and a bit of road work, the trail goes up a steep, winding, rocky hill. All the way to the top of the valley wall. Then it goes across and back down a gravel road to the bottom of the valley, through a shallow river, and back up the other side to the top of Talisman ski hill. Veronica, and Julie’s husband, Ron were both there waiting to crew for us. Veronica browbeat me into putting sunscreen on, gave me some gatorade, electrolytes for Diego, and sponged him off. She also gave me a cold, wet cloth which I wrapped around the back of my neck and left there. Instant cooldown. 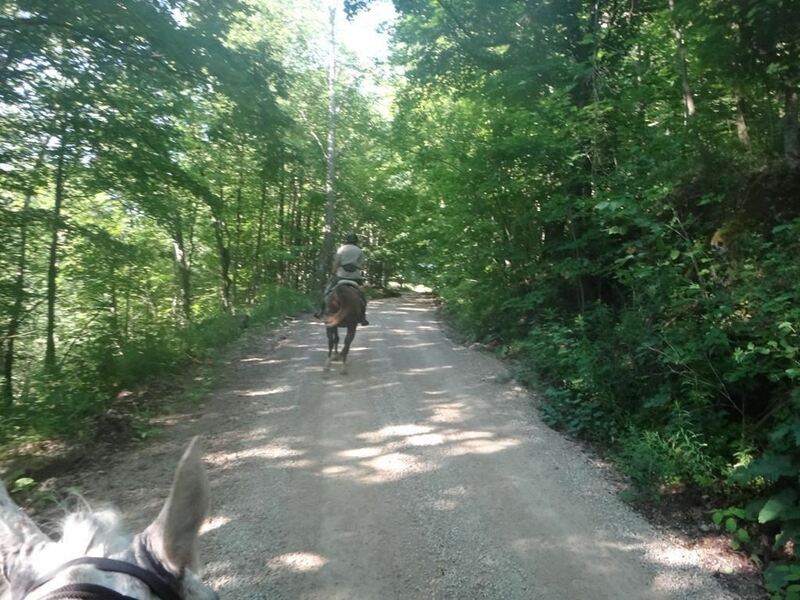 We’d caught up with Erin and her horse Brego at the top of Talisman (I think she was hoping her pit crew would show up), and she rode along with us from then on. And her pit crew found her shortly after we left the check. There was a new section of trail later in this loop that was just gorgeous. Mowed trail around a small lake. It was just gently rolling and we had a lovely long gallop around it. Then back into the winding forest trails. There’s a lot of variety in the trails. 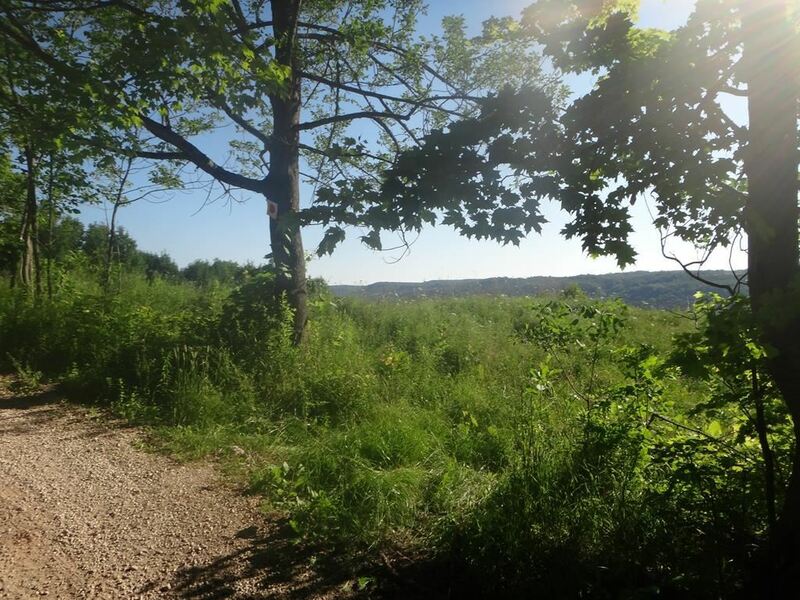 Open fields, huge hills, winding forest trail, gravel roads, and open meadows at the top of the ridges with views for miles. It’s a truly beautiful trail. There are quite a few water crossings, and although he didn’t drink for the first 10 miles or so, Diego drank at every opportunity thereafter. And wow, did he ever drink a lot. He wasn’t as keen on the water troughs, but he loved all the creeks and rivers. He didn’t get an unusual amount of electrolytes either. Just about his usual one syringe at each water trough and two at the mid check. When we came into the mid check, Diego pulsed down quickly. He was not nearly as hot as I was. It took minimal sponging to get him to 48, and the vets gave him A’s on everything. He was very well behaved. Veronica trotted him out for me since I was having a bit of trouble figuring out if the water was going to stay down after drinking it. Nancy made me take some Tums, and Marion gave me Rescue Remedy. I drank a couple of bottles of water and a gatorade, and eventually started to feel a bit less queasy and disoriented. Diego ate and drank well through the check, and seemed in good order when we left. Erin was a few minutes behind us out of the mid check, but I think her little horse was on a mission to catch back up. He was back with us well before the water stop at the top of Talisman. We went back down the hill. And for a few minutes I worried that Diego might have taken a bad step behind, but he seemed to work through whatever it was and felt fine by the time we got to the bottom of the hill. We went through the river, and then up the hill to the top of the other side. Then across and back down into the valley again. I could tell as we started up the ride n tie hill that Diego was getting tired. One log that he had to step over was just too much effort and he sort of tumbled over it ungracefully. But he kept his feet and carried on. Every time Roy picked up a trot ahead of us, I could feel Diego’s disappointment “he’s trotting AGAIN? Can’t we walk? Oh… FINE!” and he’d motor to catch up. But his relief was palpable whenever Roy slowed back to a walk. I think Erin’s horse Brego was having similar thoughts behind us. At the end, Diego pulsed down well within the 20 minutes. We went into the shade to wait for his 30 minute vetting, and Marion did some of the TTEAM ear work on Diego and let him graze a bit. He was very relaxed and although I know he was tired, he really didn’t look it. He got all A’s on his final vetting and a pulse of 49. That’s high for Diego, but I figured it was the heat and the hills. However, a couple of hours later, it became apparent that his back was really very sore. I’m not sure if the vet actually checked his back (I was pretty foggy at the time) or if that came up later as he stiffened up. But he definitely needs a better fitting saddle before he does any more serious rides. In hindsight, I think that coming down Graham’s Hill with a sore back on slippery gravel was what made him feel odd behind. And it’s probably why his heart rate was 49 and not a bit lower (though his 49 was better than most of the other horses in the set speed). I really could not have asked for a more perfect horse through the day. 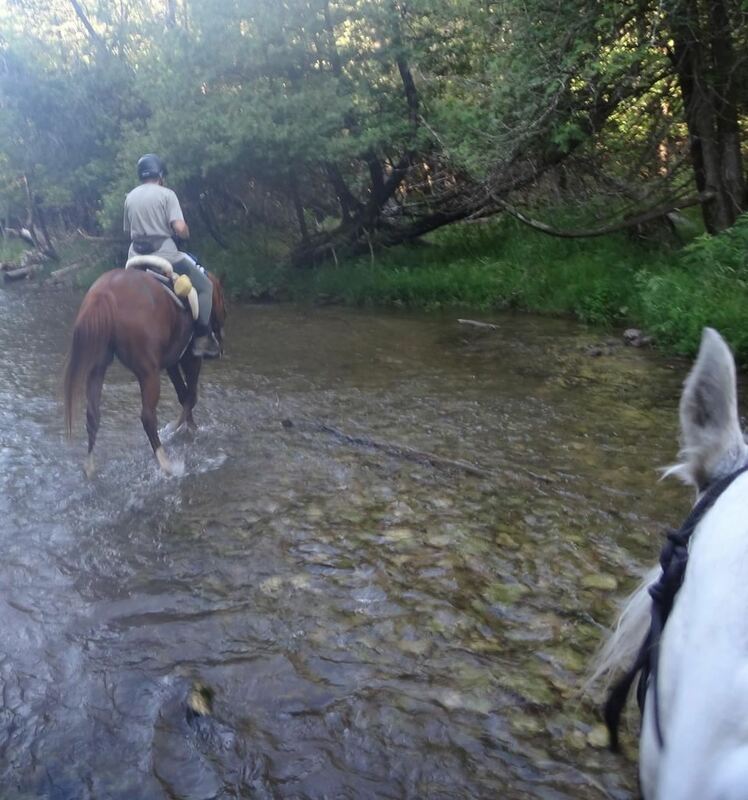 He behaved perfectly in the checks, perfectly for crewing, and perfectly on trail. He led and followed, and he wasn’t spooky. 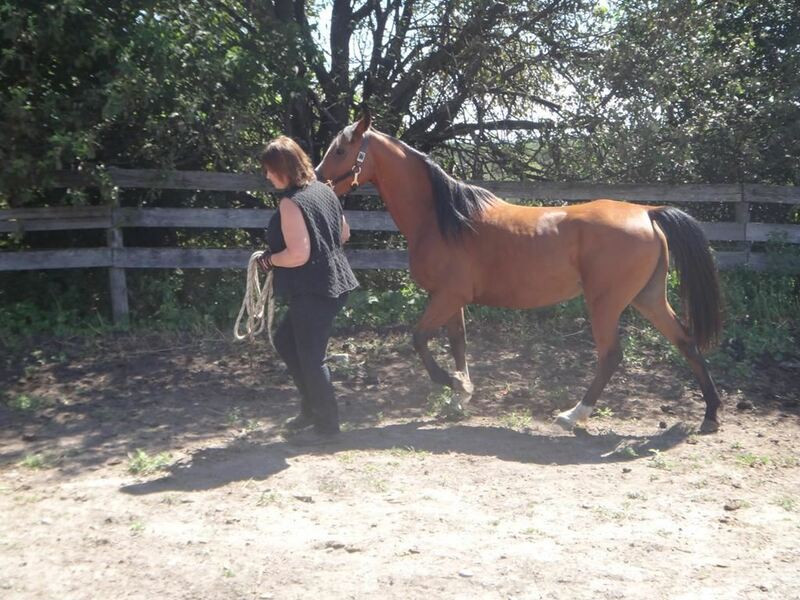 He trotted and cantered, very relaxed, on a loose rein. 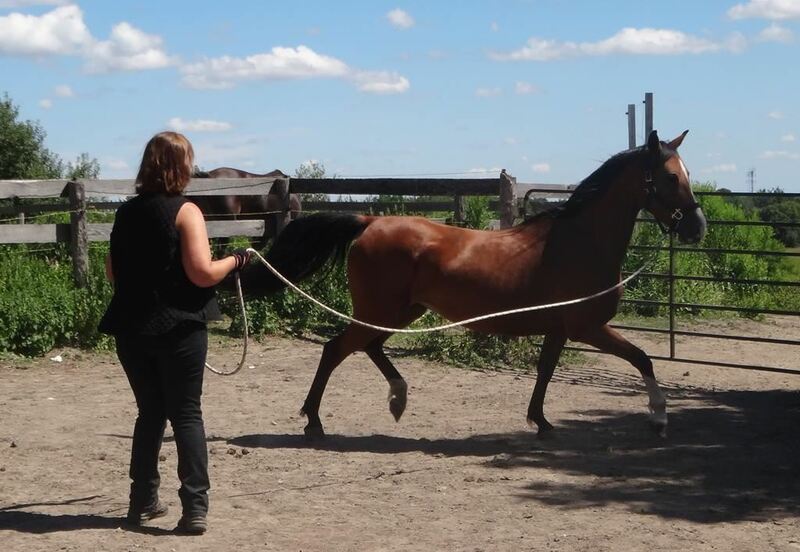 He has really caught on to the neck reining and was doing tight trail easily. No tripping (well… except for the big log!) or ADHD silliness. However, I have Julie to thank for getting us in at a good speed. I didn’t have any energy to encourage him, and I think we’d have flagged badly in the last five miles. That of course is my fault though, not Diego’s. He’s had minimal conditioning, and he was just a little superstar out there despite being tired, and having an overheated and even more tired rider. Oh and last but not least. My amazing pit crew. Veronica drove all over the place, out in the hot sun and humidity, and make sure that Diego and I were both drinking, eating, and cool enough to carry on. She trotted him out at both vet checks, and had my camp all packed away by the time I got back from awards. It was her first really serious pit crewing session, where she had to travel around meeting me at various points, and I could see her developing a system through the day. She was a total pro by the end of it. I’d never have finished without her either! Veronica’s husband Brian, who was the head timer, sat out at that ride in the hot sun ALL day. Long after I was finished, waiting for the last of the 50s to come in. He had a touch of heat stroke I think. Nancy (the ride manager) thinks Brian walks on water. And maybe she’s right! Going slow is really hard. I’ve been inching along with Venice, trying not to scare her timid little soul into panic mode ever since she arrived. And sometimes, I just want to completely overwhelm her and force her to accept human contact. More than likely, if I hadn’t broken my elbow, I would have lost patience somewhere along the way. Knowing that I didn’t have the strength to engage in any kind of battle with a horse has prevented that. But it didn’t prevent a whole lot of self-doubt and worry that I was never going to progress with her. Lately though, there has been a change in Venice. She’s initiating contact with everyone, not just me. She has been reaching out to touch people when they have their backs turned to her. Lately, she’s been reaching out even when they are facing her. She’s learned to take treats (carrots mostly) from quite a few different people. I can walk directly up to her in the stall and touch her shoulder. After a few minutes of rubbing her neck and talking to her, I can snap a lead shank to her halter. She leads quite easily and softly, but if something startles her, she bolts. I use a 22 foot line and gloves so that I can stop her if that happens. Yesterday’s session was pretty good, and she showed some progress. After I got two sort of oval-ish circles, I called it a day and turned her loose. Today though, she was a star. I guess she’d thought a lot about that lesson yesterday, because she responded instantly to my cues. She was circling beautifully, at a trot, with her head down and eyes soft. I never asked for more than two full circles before halting her and telling her what a genius she was and giving her neck a rub. After a few minutes of that, I decided to try her bad side. It took a months before I was even allowed to look at her left side. So I was expecting circles to the left to be considerably harder for her. She definitely spooked when I asked for it. But settled after only about two repetitions. 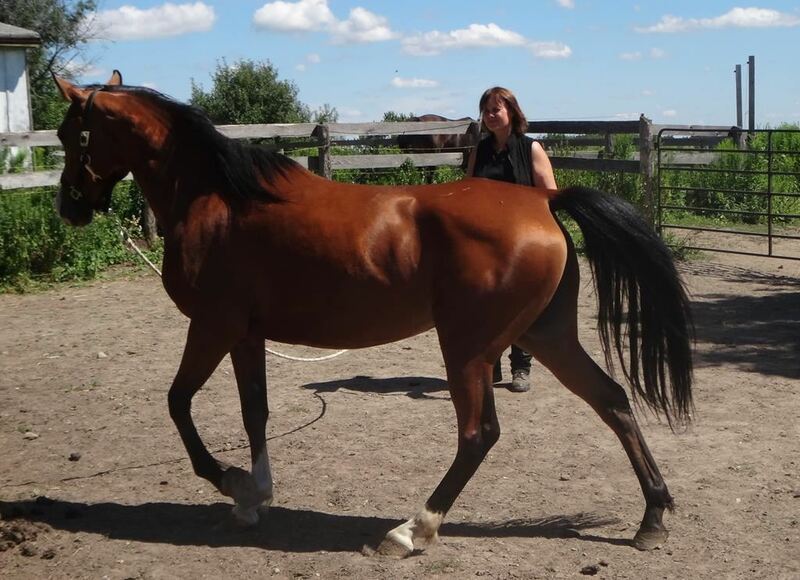 She’s a bit more lateral – her hind end was scribing a much larger circle than her front end. But she understood what I was asking and was not terror-stricken. Within a few minutes, I had her doing quite credible inside turns on cue. So I could send her to the right for half a turn, then switch hands, lift my right hand and have her come around and circle back to the left with no hesitation at all. And I really think, for the first time, that she was pleased with herself and aware that she was accomplishing something. She looked at bit smug by the end of the session. The first signs of real confidence. For the last week or so, it’s finally felt like Venice is calm and confident enough to actually learn. She’s starting to think about what I’m asking her, instead of trembling and fleeing madly at every new movement or noise. And as a result, I’m seeing noticeable changes in her every day.